2 yards ribbon of your choice; cut into 6, 8-10 inch long pieces. *To start! 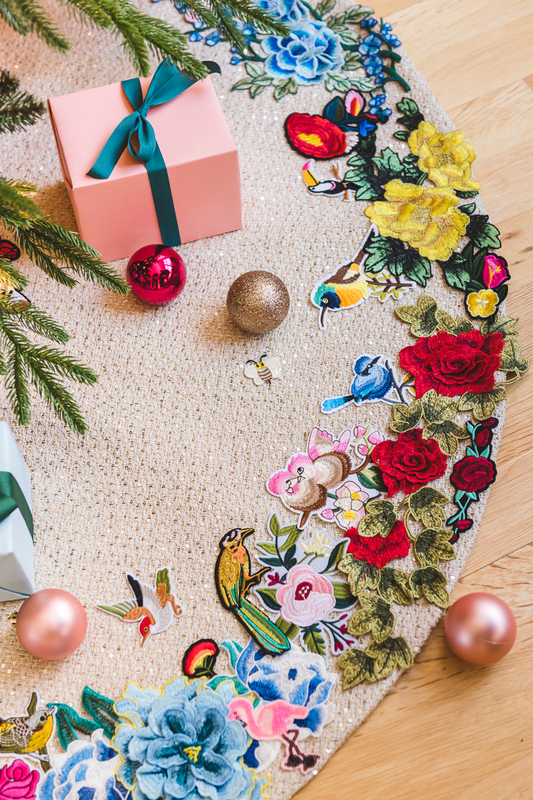 Decide how large you’d like your tree skirt to be. This will determine the amount of fabric you’ll need. 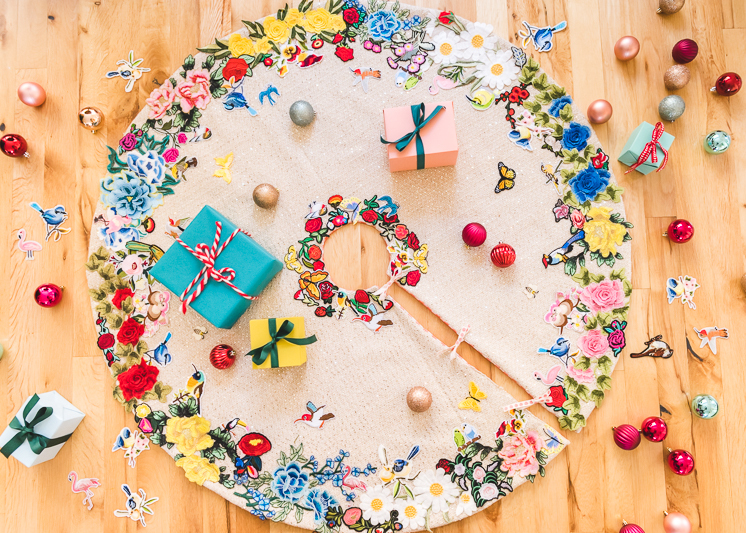 The average tree skirt measures anywhere from 40-inches to 60-inches in diameter. 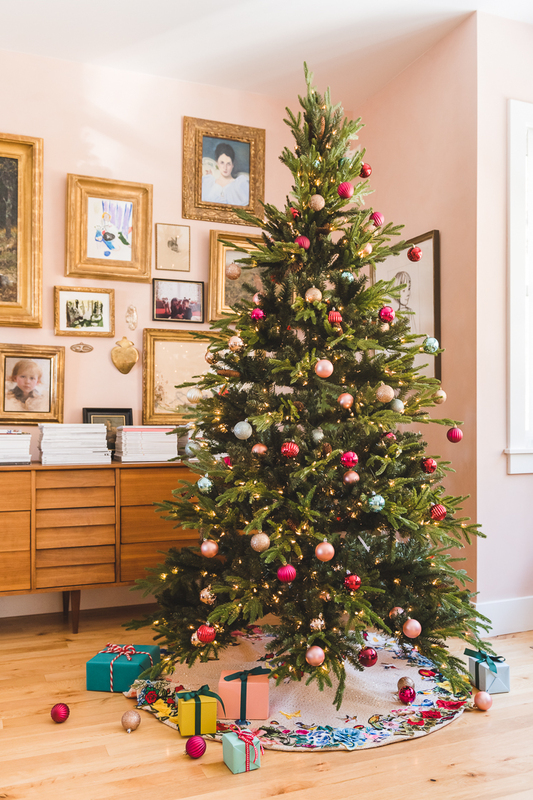 A good rule of thumb is to make your tree skirt as wide as the bottom branches of your Christmas Tree. Ours is about 50-inches wide and the measurements we provide will reflect that end measurement. 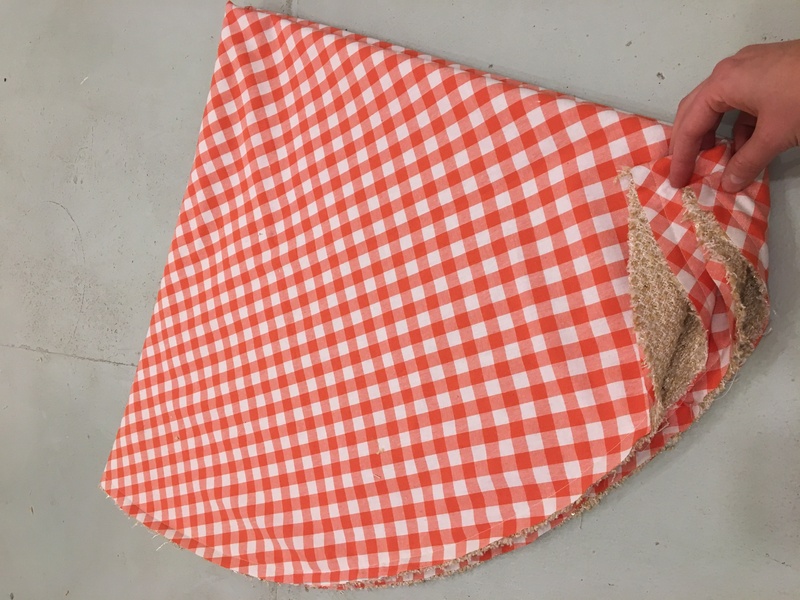 Take your lining fabric and fold it in half lengthwise, and then fold it in half again widthwise. 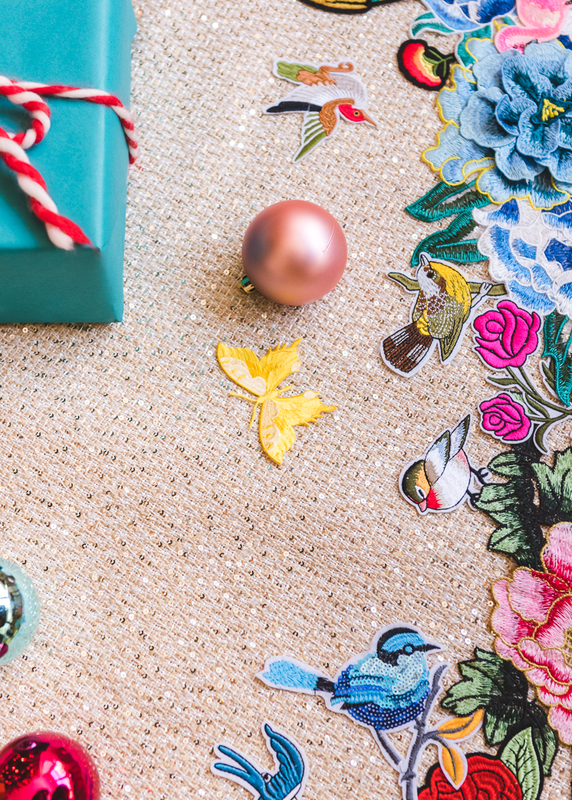 Identify the corner where all the folds meet, this is the center of your tree skirt. Hold the end of a measuring tape at the center point and measure out 26″. 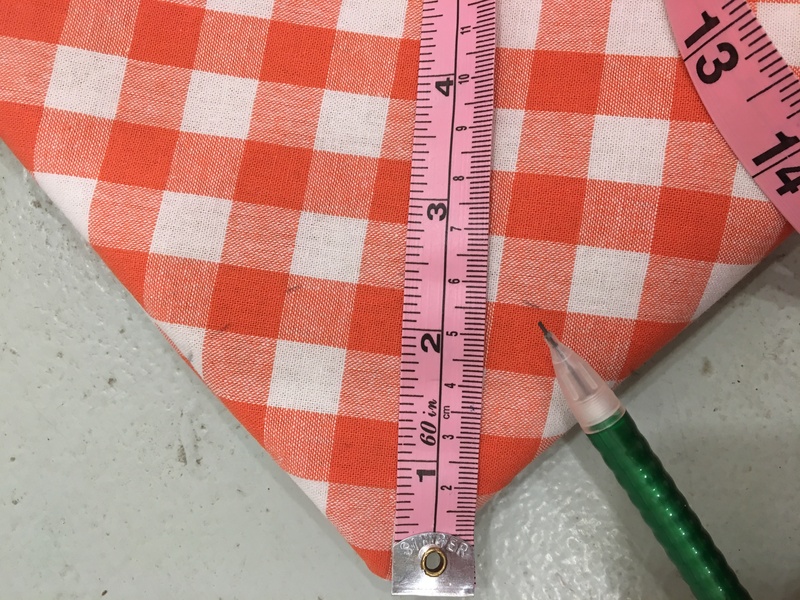 Mark that measurement with a pin or a small pencil mark. 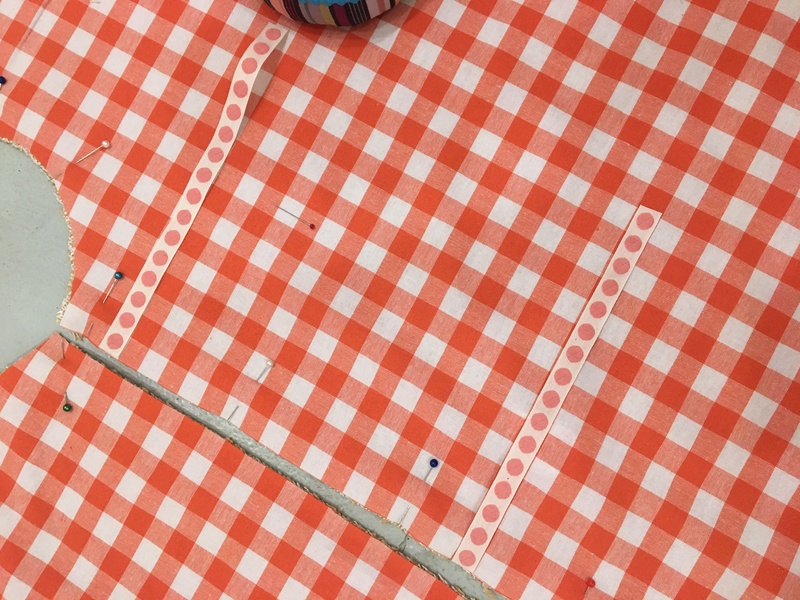 While keeping one end of the measuring tape on the center point, move the measuring tape along the outer edge of the fabric, marking every few inches to identify the outer edge of the circle. Cut along your markings through all the layers of fabric. Once you unfold your fabric, you’ll have a circle. 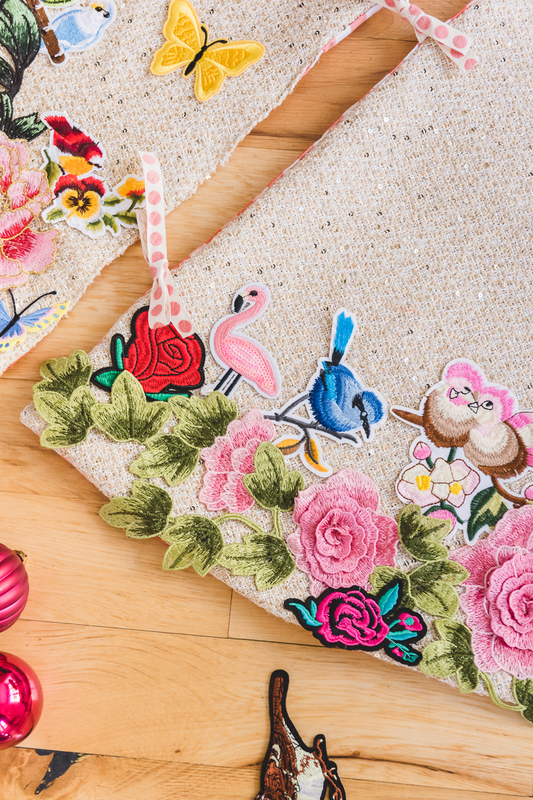 Lay out your top fabric and place your tree skirt lining on top. Pin the layers, right sides together. 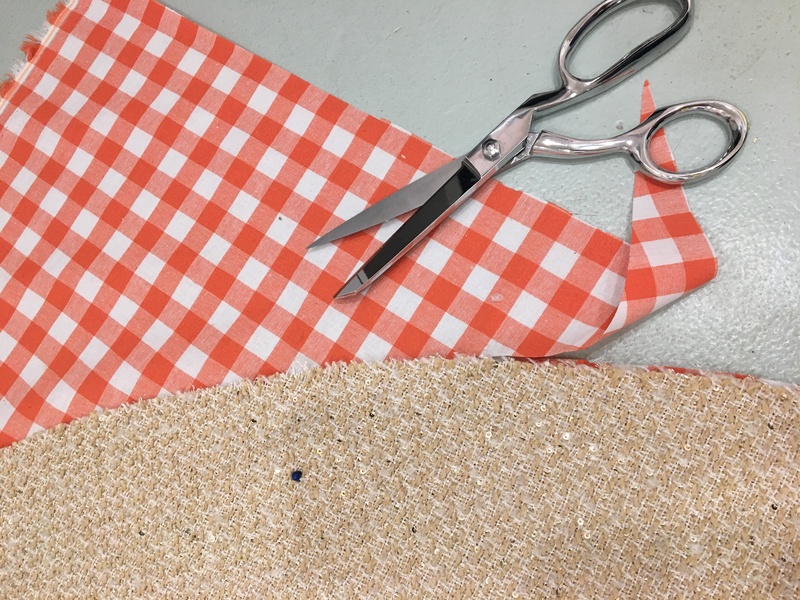 Using the lining as a guide, cut out the top fabric so the lining and the top are identical circles. Keep the circles pinned, right sides together, and sew along the outer edge with a 1/2-inch seam allowance. Now fold the tree skirt in half, and then in half again, like you did with the lining at the beginning. It should look like a slice of pie. Take the measuring tape and place it at the corner where all the folds meet. This time measure 2.5-inches outward and mark it. Move from one side to the other, until you’ve marked the entire tip of the pie. Cut off the tip to create a hole in the middle. Cut a straight line from the outer edge to the hole. this will allow you to wrap the skirt around the tree. 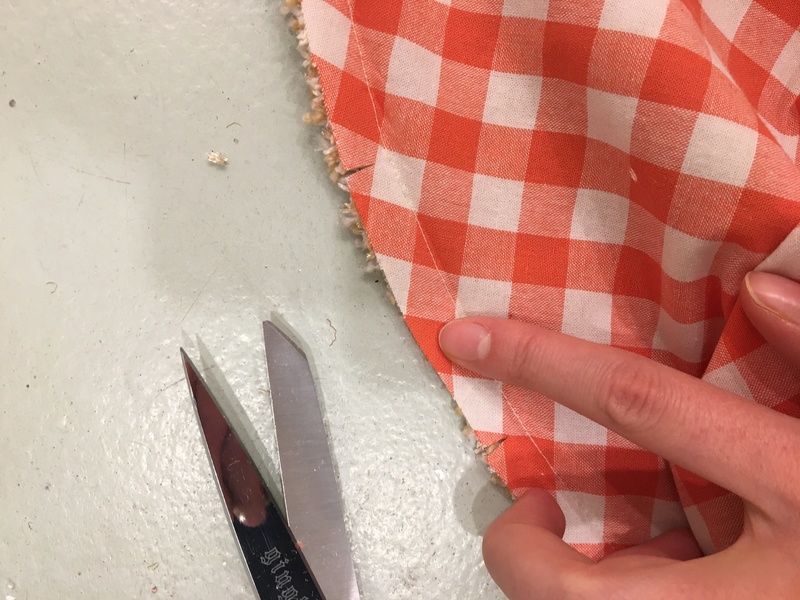 Now pin the edges of the fabric together: up the slit, around the center hole, and halfway down the other slit. For the ribbon ties, mark 3 spots equidistance from another along the slit of the tree skirt to identify where you’d like the ties; one at the top, one in the middle, and one near the bottom. Start on one side of the slit and sandwich the ribbons between the lining and the top fabric, making sure to line up the edge of the ribbon with the edge of the fabric and keeping the long end of the ribbon hidden between the layers. If the ribbon has a “right side,” position it so the “right side” of the ribbon is kissing the “right side” of the top fabric. I placed our ribbons about 10 inches apart from one another, with a little wiggle room on top and on bottom. Pin the other side together with the ribbons like you did the first side. You’ll want each side of the slit to mirror each other, so the ribbon ties are directly across from one another, at the same measurements. 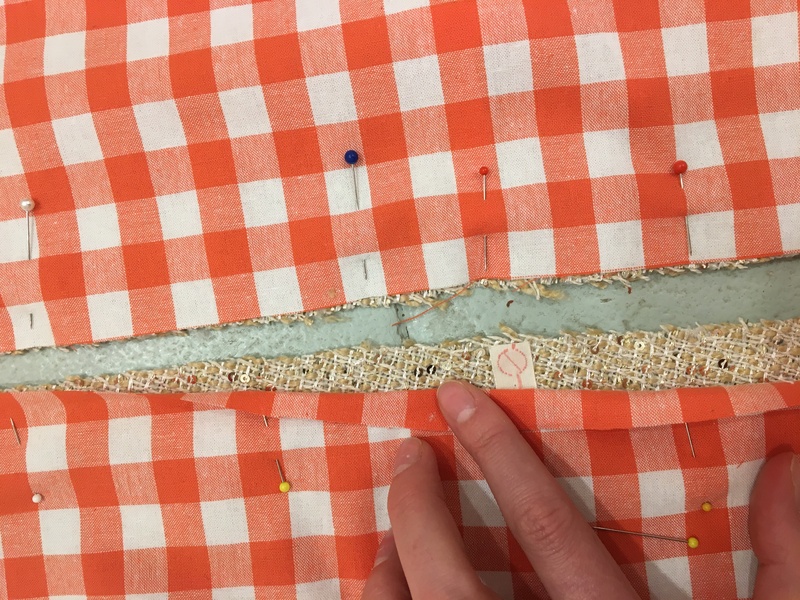 Sew where you pinned with a 1/2-inch seam allowance, making sure to stop once you’ve reached the halfway point on the other side of the slit. 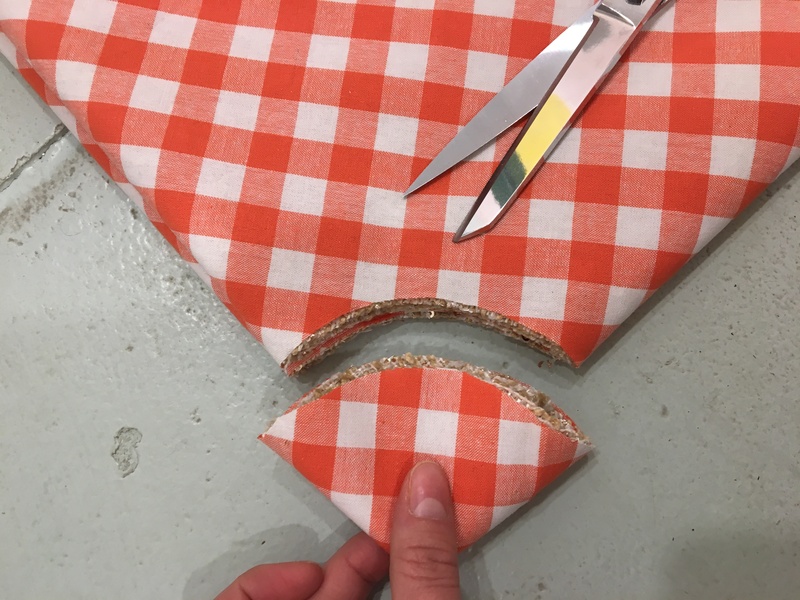 Clip the outer edges and inner circle of your tree skirt by cutting small slits into the seam allowance, being careful to not cut through the seam allowance. This will allow the tree skirt to lay flat and not pucker when you flip it inside out. 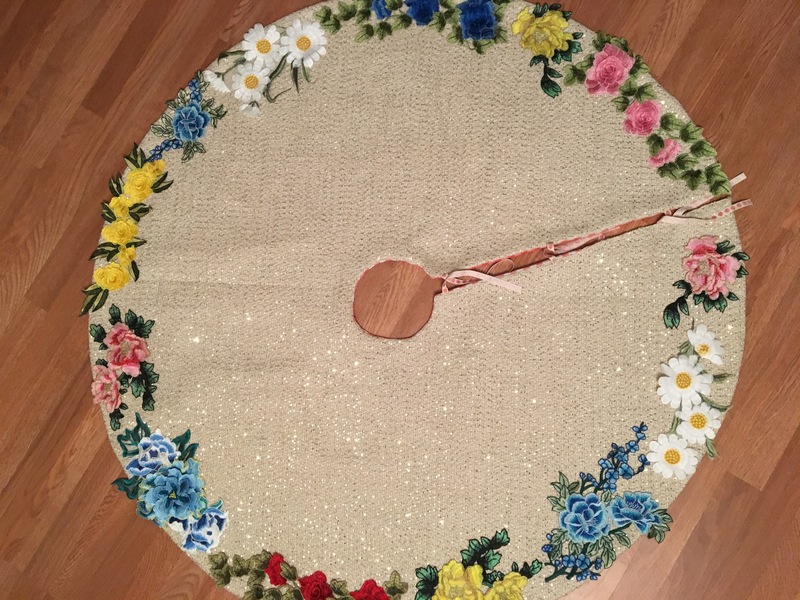 Flip your tree skirt right-side-out. Iron the seams flat and favor the edge so that the lining doesn’t show on the upper side. Where you left the seam open, iron the edge 1/2-inch under on both layers of fabric, so that it aligns with the portion of the skirt already sewn closed. Then pin the bottom half closed, making sure to insert any of the ribbon ties left. Top stitch the pinned opening closed, with a seam allowance super close to the edge. 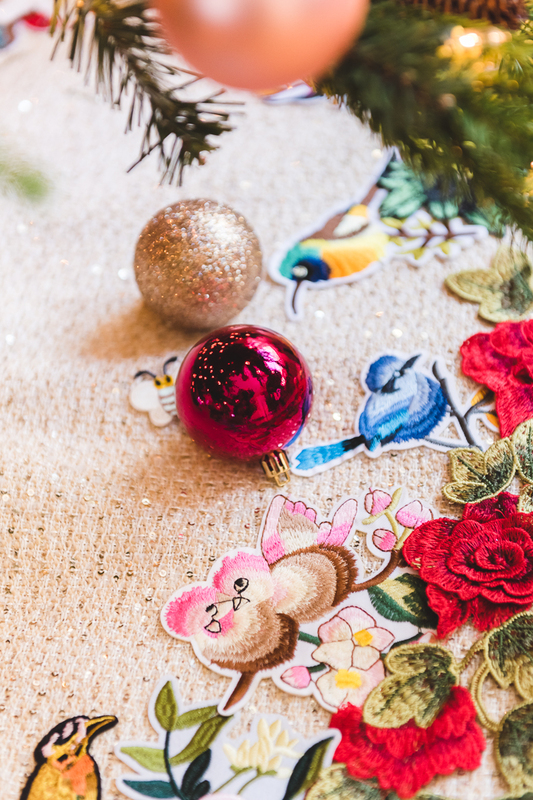 Lay out your tree skirt, and arrange all your patches along the edges and along the inner circle of the tree skirt as you’d like. 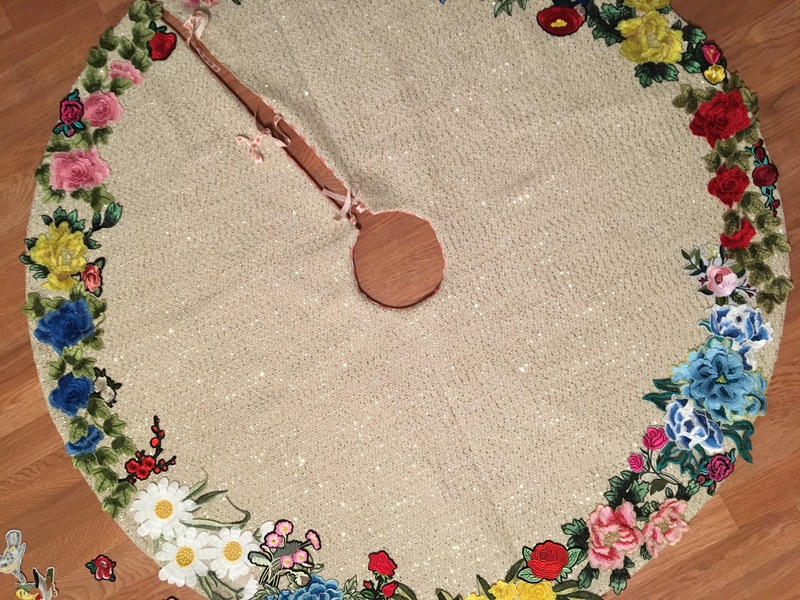 I started by evenly spacing the large flowers around the outer rim and gluing them into place. Then fill in with some of the medium sized flowers. 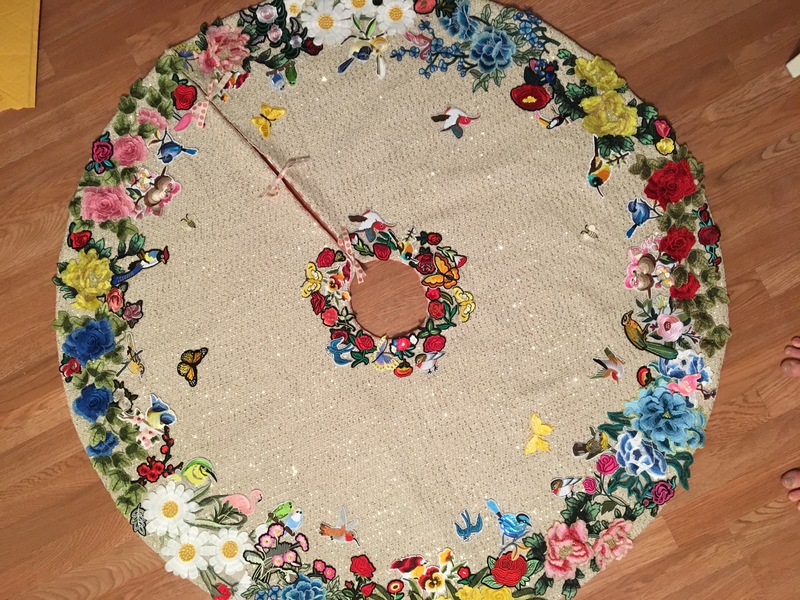 Finish with the smaller flowers and additional birds and butterflies, remembering to go around the inner circle as well. 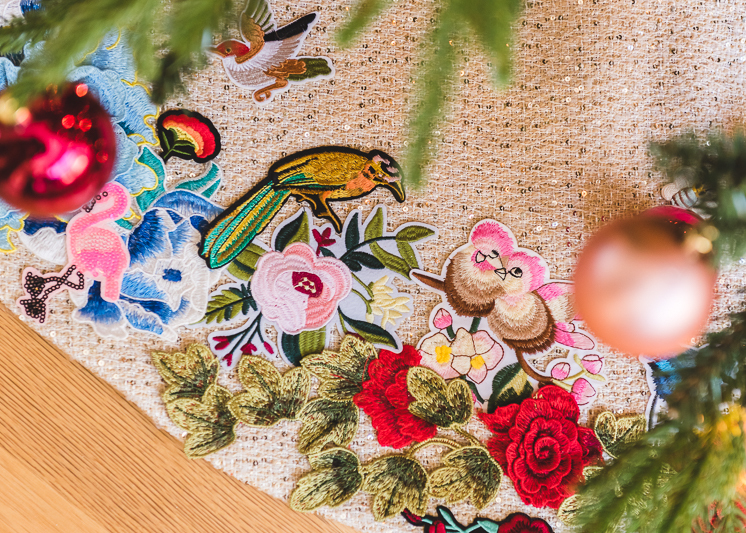 Wrap around your tree and bask in the glory of your stunning new Applique Tree Skirt Hack! I love this so much! Genius. This is so incredible! LOVE it. What type of glue did you use? Love it!!! Thanks so much! We used Liquid Stitch! You can buy it at any craft store or on Amazon. Wow! I was checking out the prices of your patches and thinking this must cost a couple hundred dollars to make…why not just buy the already made one?? 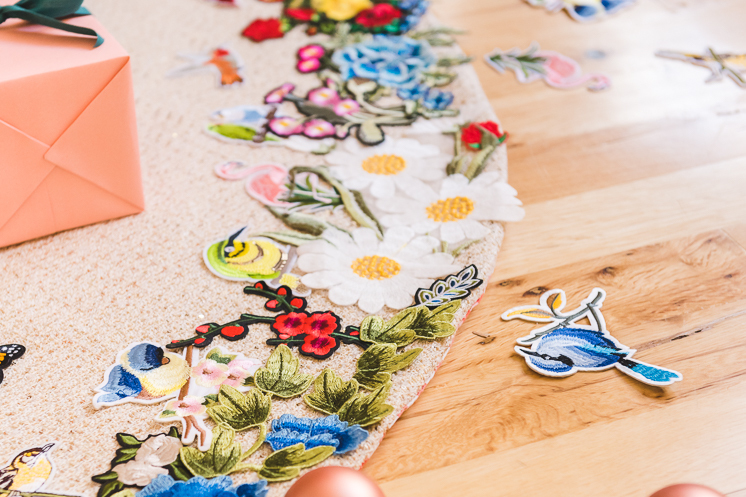 Then I clicked on the Anthropologie link….gulp! 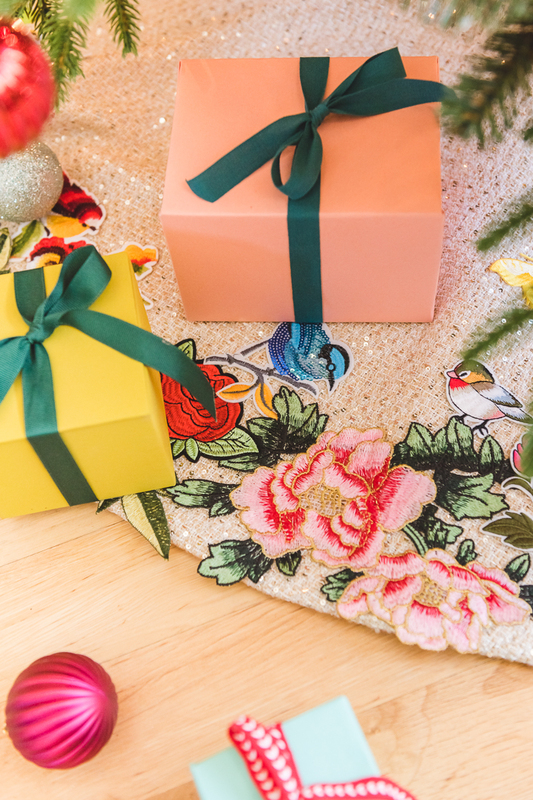 Who in the world can spend $900 on a Christmas tree skirt?!! Haha! Yes exactly! The total price comes out to around $150, and though pricey, it is certainly an heirloom piece you’ll have forever so we think it’s worth it! It’s really nice, although a little bit harder to DIY or so it looks to me. You are very talented! Thank you! It’s really not too difficult! 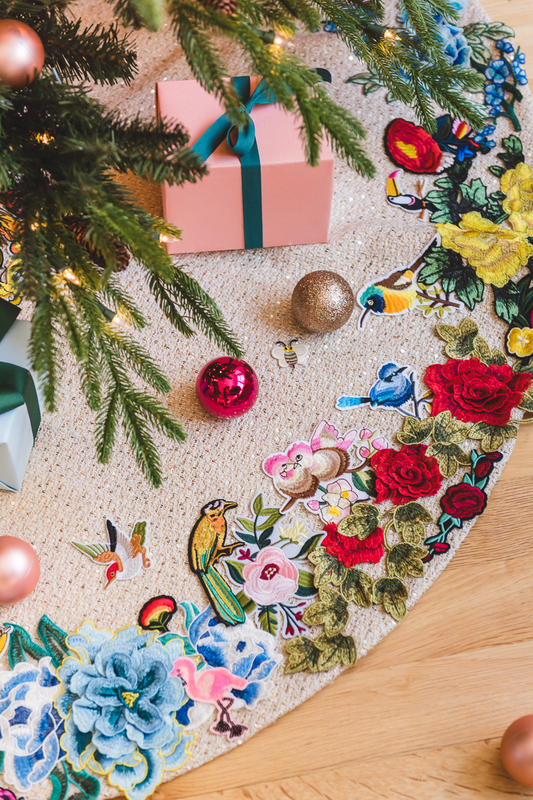 You could actually just buy a pre-made tree skirt and add on the patches to make a quicker version! This is AMAZING!! So great! 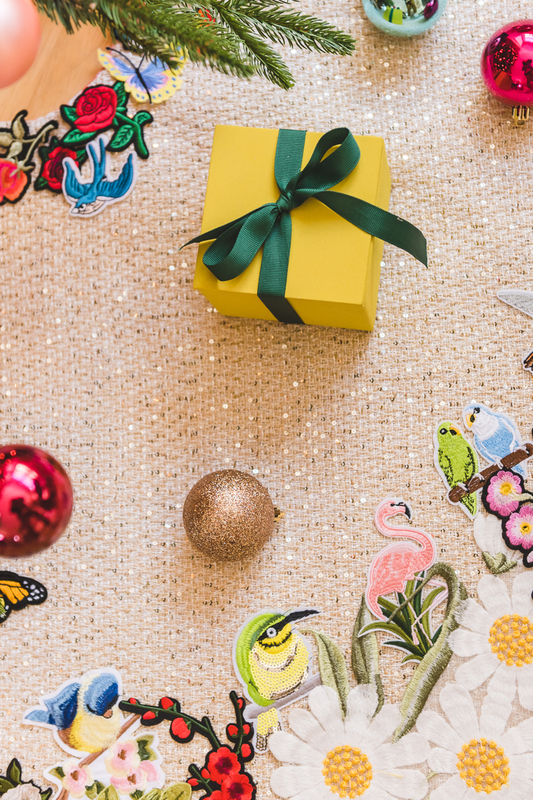 Can you also share the sources for the pretty paper that you wrapped the presents with? I love the colors!! Thank you! 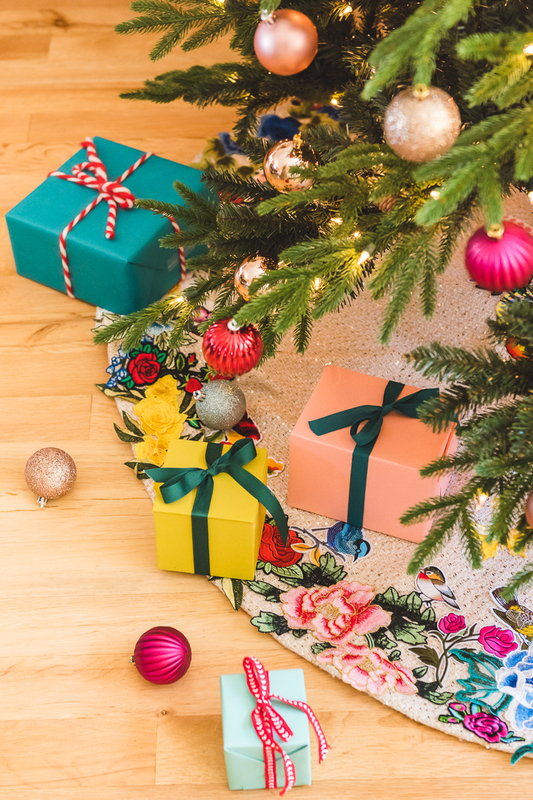 The teal wrapping paper is from Paper Source and the rest are actually just wrapped in 24″ by 12″ pieces of cardstock from the Cricut Website. They have some really pretty colors!